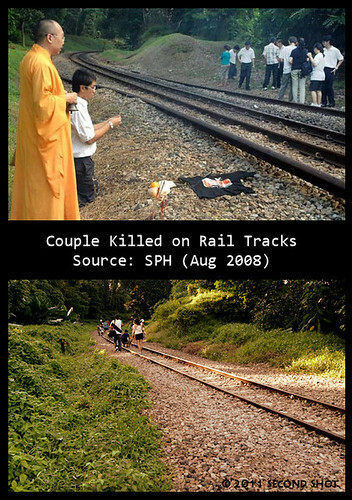 My last act on the railway line on the 31st July - the last day before the rail corridor was closed to public access - was to revisit the site where one of the most tragic and gruesome railway accident in recent history happened almost exactly 2 years ago. On Aug 8, 2009, Republic Polytechnic students Goh Sheng Yao and Clara Lee Jing Yu were on the track near Rail Mall when they were knocked down by a train around 5am. They were killed on the spot. How did that happen? I remember the accident quite vividly because I was in Malaysia during the National Day long weekend. In fact I was still in Singapore when the accident happened on Saturday morning but I didn't know about it until a friend informed me via SMS. Coincidentally I also took a train to Kuala Lumpur that used the bloodied tracks a few hours after the accident, luckily I took it at Johor Bahru in the afternoon though it was delayed for 30 minutes. According to reports, due to the accident, the morning shuttle between Johor Bahru and Singapore was cancelled and four other train services were delayed between one and two hours. The accident was to become quite "memorable" for me as over the next few days, many of the local rail fans would curse and complain how the couple should not be on the tracks; how their act affected other train services; how their action could endanger the train and its passengers and so on. It was also the media at its worst; some of the fans interviewed later complained how they were misquoted. 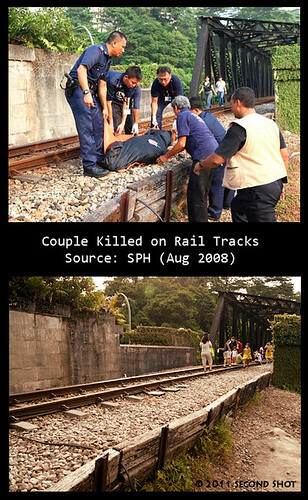 I knew about it because we were talking about the accident while transpotting at Bukit Timah Railway Station. The New Paper later managed to interview the driver who knocked down the couple. I remember buying a copy and keeping the news clip for a long time. 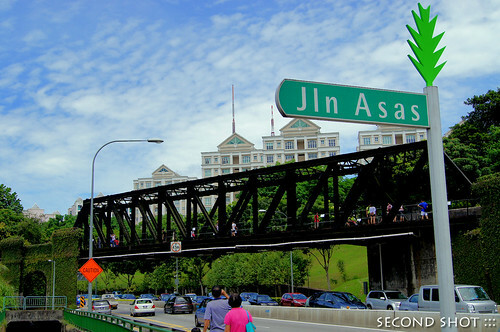 The accident was to stay in my mind: the truss bridge near Jalan Asas where the couple was knocked down. 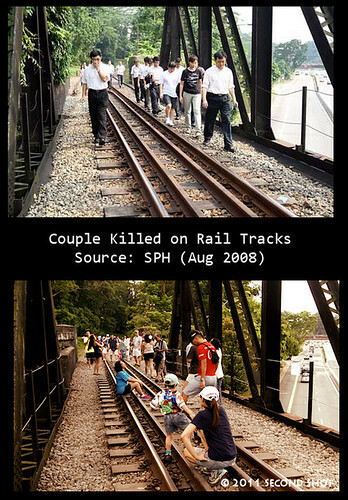 In the two years since it happened, I would think about the accident every time I took the occasional train between Singapore and Malaysia, when it crossed the truss bridge at Rail Mall. I would glance through the window or stuck my head out of the train door, wondering where the couple was knocked down. I did not contemplate trespassing onto the bridge to find out. In 2011 I finally got the chance, thanks but no thanks to the bilateral agreement between the two countries. It was to be my last chance, a second last shot at it when I knew the tracks were to be removed - quite swiftly. 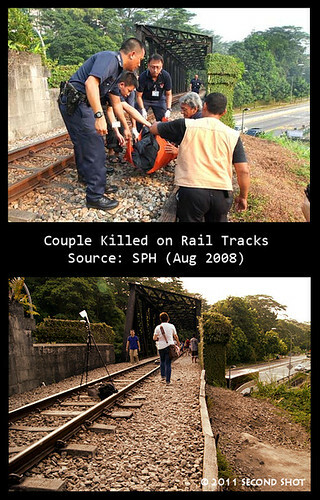 Using photos, media reports and some guesswork, I revisited the site and found out it is still possible to trace the sequence of events leading to their fateful encounter with the train. The story begins not at the bridge but at one of the restaurants in Rail Mall. Just like how we - rail tourists - go up to the bridge today, the slope in front of Busy Bees Learning Centre was the way up and down the bridge in 2009 so the couple probably went up the same way. Photo shows the police about to move the body bag down the slope using a temporary stretcher. 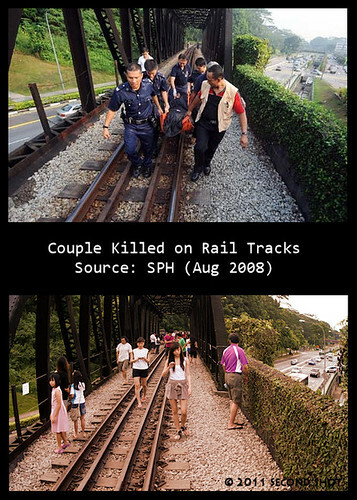 The bridge, which became a tourist attraction only recently, was where the couple and police walked before and after the accident. Photo shows the police carrying a temporary stretcher with the body bag on it. In the photo, we see relatives of the victims in two neat rows walking towards Rail Mall direction after checking out the accident site. 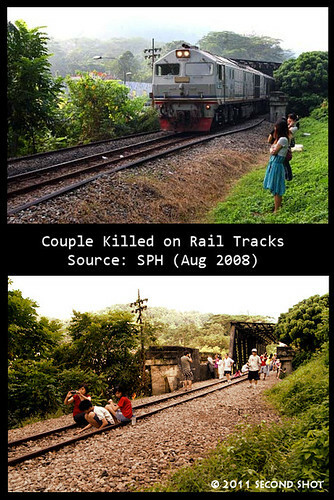 Today rail tourists roam free capturing happy memories, oblivious to the tragic accident which took place after the bridge. The next question was a most intriguing one for me: where exactly did the accident happen? Most reports do not mention the exact location, only that it happened near the railway bridge. Even on the day before my exploration I could not pinpoint the accident site. It was kind of confusing because the track, shaped like a 'S' curve, with the lush greenery alongside makes the view in both directions quite indistinguishable. 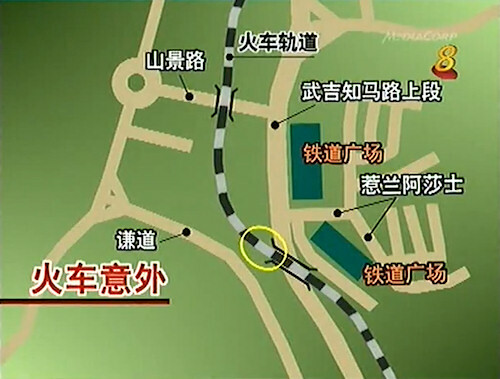 Thank goodness, this map graphics from Ch 8 news unequivocally states the site (circled). The accident happened after the bridge in the direction of Woodlands. 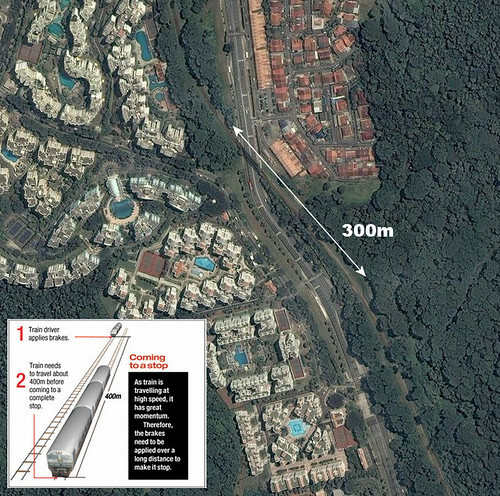 From the photo evidence available, the accident site should be at the track about 15m or more after the bridge. There is nothing unusual about that part of the track today; in fact when I was there, I saw some folks sitting on it! The family wasn't really bothered when I told them they were sitting in the "kill-zone". They knew about the accident and were talking about it when I interrupted them. I told them my purpose and that I am a blogger. Family of Goh Sheng Yao at the site in a ritual to pay their final respect. This is where the couple was believed to have been knocked down. 2 years after the accident, these folks definitely have no fear sitting in the "kill-zone". Monk chanting prayer with the brother of Goh Sheng Yao offering respect. It is possible to reconstruct the few seconds before tragedy struck because the media reports then were quite graphic [source, source]. The news must have made its round in KTM and rail fans told me how Clara was looking at the driver - with her eyes wide open - before the locomotive YDM 6375 ploughed onto her. When the train was about 100m away (probably around start of bridge), the shadow turned out to be two people sitting on the inside of the track and facing each other. The e-brake was applied immediately but too late. Train crossing Rail Mall bridge in 2009. 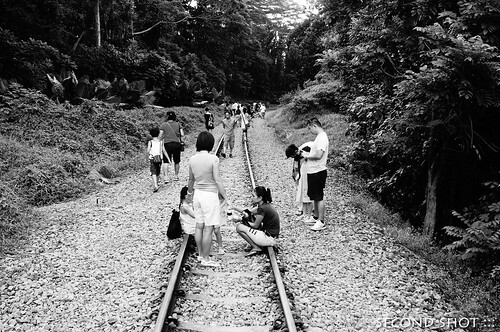 Folks today would get tired from all the walking and happily sit on the track. The tragedy site. 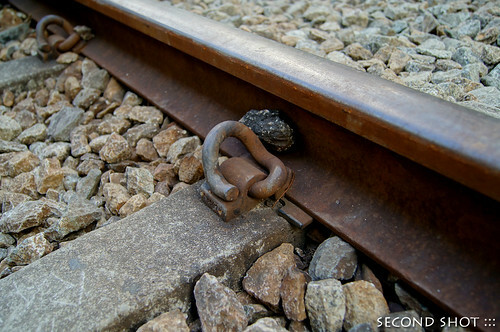 According to the driver, Clara was sitting cross-legged on the track (ballast or sleeper) and not on the two metal rails like these folks. 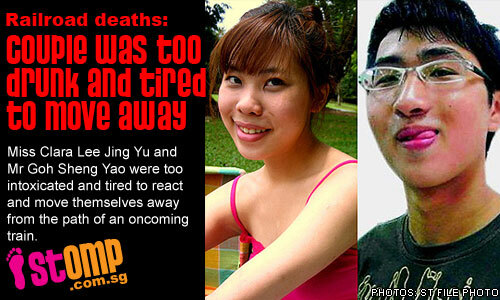 The train dragged the two bodies along the track before it came to a complete stop about 50m away. When the driver went down the track to check, neither was breathing - Sheng Yao, face down on the right side of the track, his left leg severed; Clara, face up and in red outfit. It was a grisly sight. The blood-stained metal rails in 2009 (top). The rails today (bottom), betraying no sign of its bloodied past. Or I did not look hard enough? This little exploration concluded my activities on the Rail Corridor in July. Coincidentally the last day the Rail Corridor was opened to public was also the first day of the 7th month in the Chinese lunar calendar. It would be wise to steer clear of the track during this period when the gates of hell is opened and inhabitants of the netherworld roam free on earth, according to Chinese superstition tradition. Perhaps the gates could not stop the two departed spirits who suffered an untimely death from making an appearance before the stipulated date ... what do you think? "Perhaps the gates could not stop the two departed spirits who suffered an untimely death from making an appearance before the stipulated date ... what do you think?" @ Icemoon: "The rails today (bottom), betraying no sign of its bloodied past. Or I did not look hard enough?" The fluids, organic remnants & most of the bones would have been washed away or removed by those who cleared the scene -- & subsequently by weather elements, the effects of decomposition, & possibly fauna (or even "souvenir" hunters). 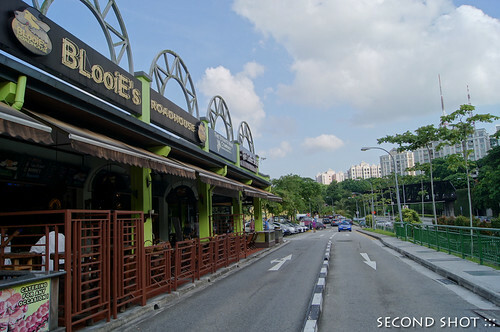 Perhaps small fragments of bone & hair might still be scattered along the affected stretch, before S'pore's bulldozers went in more recently to finish the job. I wonder though what you might have done, if you had "look[ed] hard enough" & actually found something. The photo-blog 'Monday Morgue' has a section featuring images of fauna that were apparently killed by KTM trains. I'm trying to imagine a photo of bone bits labelled Homo sapiens sapiens. 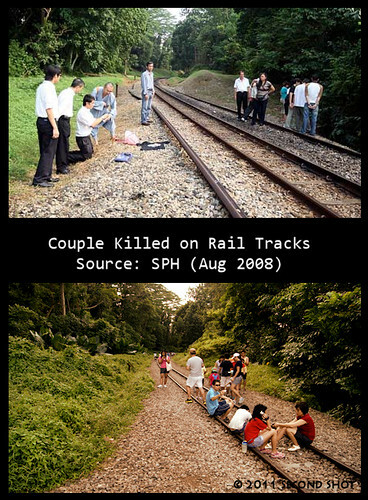 It's also interesting how the press jumped to the conclusion that the couple had planned this as a suicide (ref: your photo). It's probably a coincidence that the girl was Chinese & wearing red. It was perhaps the time of the accident that led to the jumping of conclusion, what were the couple doing on the track at that ungodly hour? I knew the girl, she was a schoolmate of mine from primary to secondary school (both schools were affiliated). We heard the news the day after the newspaper report through the old students network while at a friend's birthday. I remember a friend of mine being quite upset about it as she was a close classmate. Hi Samuel, nice to hear from you again. Yes, yes it was; we never believed it was premeditated. Mostly trash talk from the gossip rags. Thank you for your second shot and well written article. I would have commented earlier, but I had the most awful problems with my computer that actually prevented your blog from loading! Quite a mess, that. Its a lovely read and I can feel the love and hard work that has gone into this blog. Keep it up! Thanks for your encouragement, Samuel!